BBQ Apron & Hat is made with featured fabric. The apron pockets hold knife and fork utensils Also comes with matching cap. Snowman with Hat & Scarf is made with white felt fabric. 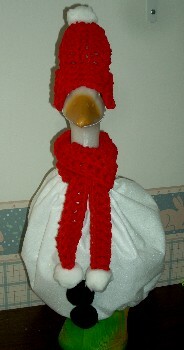 Also comes with a red crocheted hat & scarf as featured. Tulip Print Dress & Cap is made with featured fabric. 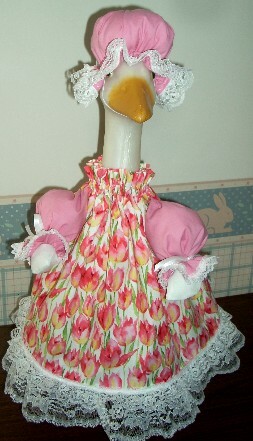 The dress is gathered at the neck and have a double lace ruffle at the bottom. Also comes with cap trimmed with lace.